Technology that allows orchard sprayers to skip the space between trees can protect the environment while saving growers money. The idea is simple: when orchards receive dormant and in-season sprays of agricultural chemicals, the spray should only fall on the trees where it is needed, rather than on the ground, where it is not. Orchard sprayers can be retrofit with target sensors that activate spray nozzles only when a tree is present. A target-sensing smart sprayer travels between the rows of a Modesto almond orchard. A review of research on this “smart” sprayer technology, published in the April-June 2011 issue of the University of California’s California Agriculture journal, found that the financial and environmental benefits of the technology are substantial. Based on field tests, the authors estimated that reductions in pesticide and operating costs with smart-sprayer technology ranged from $58 per acre for peaches grown in the San Joaquin Valley to $31 per acre for prunes grown in the Sacramento Valley. 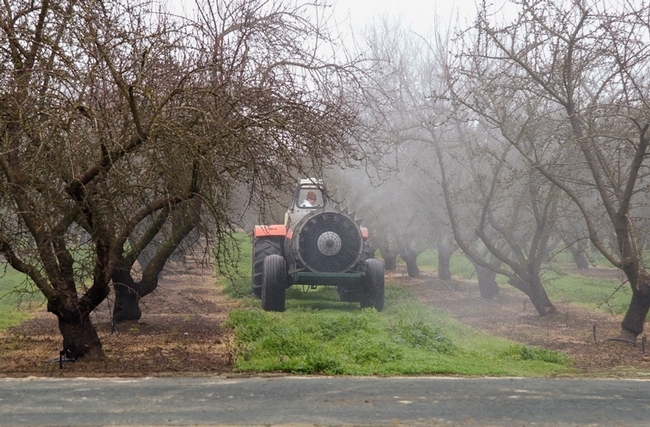 At the same time, reductions in the total amounts of pesticide sprayed ranged from 15 percent for a mature prune orchard near Chico, to 22 percent for a mature almond orchard near Modesto, to 40 percent for a younger (more open) prune orchard near Oroville. The trees themselves received the same amount of pesticide in the smart-sprayed orchards, but a lot less pesticide ended up on the ground than in the control. “For the almond and more open prune orchards, the reductions were 79 percent and 59 percent, respectively,” Giles and colleagues wrote. Likewise, when the amount of pesticide in water running off from the younger prune orchard was measured, the reduction was 54% in the smart-sprayed orchard compared to the control. Despite its obvious benefits, the study authors noted that “use of the smart-spray technology is growing but remains a small part of the spraying equipment market.” The retrofit spray sensor and control equipment cost about $15,000, with an estimated payback period of 2 years or less, given documented cost reductions. Furthermore, the U.S. Department of Agriculture’s Environmental Quality Incentives Program (EQIP) can provide up to $30 per acre for a total of $15,000 per contract when the new equipment provides a 20% reduction in spray, which as been documented in peer-reviewed research such as the California Agriculture article. “The amount is sufficient to adequately cover the cost of purchasing a typical target-sensing system for an orchard sprayer,” the authors note in California Agriculture journal.